Hello all! I'll be sharing fun foodie ideas for the blog and we are starting with . . . (drumroll please) . . . doughnuts! That's right. This is going to kick off the Family Favorites section of the foodie posts and trust me, it's a goodie! It's definitely a family favorite of ours, in so many ways. Everyone else loves them cuz they're de-lish and I love them because they're easy. So first of all, if you don't have the doughnut recipe from Mary Ann's book, get it! SO easy to make up in advance and quick to put together, just add water. Get your oil heating as it will take a few minutes. I don't have a fryer so I do it the old fashioned way . . . fill my pot halfway up with canola oil, clip my little candy/frying thermometer to the side of the pot with the tip fully submerged in the oil (but not touching the bottom of the pot) and let it heat up to between 350-375 degrees. I usually like mine about 375 best. If you have a fryer, set it to doughnut or just 350 degrees or just heat 'er up! Ya'll have it easy. If you are using the classic pot method, make sure you are keeping an eye on your temperature, adjusting it occasionally to keep it at the appropriate temperature. To make the dough mix 2 1/4 c. mix with 1 c. water. (The recipe calls for 1/2c.+1/3c. water, but for simplicity's sake I go to 1 c. and it makes the doughnuts themselves a little fluffier. Either works fine!) The batter should be the consistency of thick pancake batter. After the oil is heated to the proper temperature, drop your batter into the oil using a mini cookie scoop. This is the easiest method, the cookie scoop with soon have its very own blog post, but till then just trust me, the mini scoop is perfect for doughnut balls! If you don't have a mini scoop, no worries - couple of options here. I've done it just scooping it off using 2 regular eating teaspoons, also you can put batter in a ziploc bag, seal it, and cut a hole in the bottom corner and squeeze out little dollops. As the doughnuts cook they will turn a lovely little golden brown and should flip over halfway through. If they don't flip over, feel free to just use your slotted spoon and encourage them a little. ;o) It usually takes between 4-5 minutes and they will be a nice crispy golden brown on all sides when they are done. Take them out using a slotted spoon and drain on paper towels. Let cool for a couple minutes then roll/shake in powdered sugar, regular sugar, cinnamon sugar, or just eat them plain! They are a HUGE hit with our family and a great weekly (at least) tradition we love. We hope you do too! 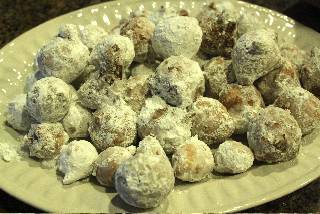 Now that you realize how fun and easy homemade doughnut balls can be, let me blow your mind . . . There are even more exciting ways to make yummy doughnut balls! I'm swallowing my pride and joy and sharing with you all my family's favorite secret doughnut recipes (that's the point of Family Favorites right?). You'll use the same steps as above, just amplify with the add-ins below. So feel free to make these your own family tradition and share other ideas you may have for our delightful little doughnut balls. Use 2 1/2 c. doughnut mix and do not add water yet! Take 4 Tbsp. of cream cheese and cut into small cubes. (I would slice my cream cheese rectangle into Tbsp. slices, then cut that in half lengthwise, then cut each of those strips into 4-5 cubes. Make sense?) As you cut these, drop them into the dry mix to coat the cubes. This keeps the cream cheese from just turning into a big yummy blog of cream cheese when you stir it and disperses it evenly through your doughnuts! Now add the 1c. water. Follow frying instruction above. We like to let the kiddos shake these in powdered sugar. Mmmmm . . . Mix 2 1/2 c. mix to 1 c. water. Stir to combine. Add to batter. Follow frying directions. We roll these in cinnamon sugar. (1/2 c. sugar mixed with 1 tsp. cinnamon.) Delish! Our first experimentation on the original recipe . . .
Just add 1/2 c. chopped nuts to the recipe and enjoy, it really does make them go up a notch! Add 2-3 Tbsp. cocoa powder, 1 Tbsp. water, and 1/4 c. chocolate chips to batter. Add 2-3 Tbsp. cocoa powder, 1/4 c. chopped nuts, 1/4 c. shredded coconut to batter. Future posts will be divided into the following categories: Family Favorites, Gadgets & Gear, Tips & Tricks, and Misc. If you have any questions or ideas for a post or want something covered, let me know and we'll squeeze it in somewhere. Now get cookin'!